Ms. Min Lin is an accomplished performer and teacher of the guqin and zheng Chinese zithers. She belongs to the Guang Ling School of guqin performance. She began studying the zheng in 1987 and began her studies on the guqin in 1992 from Master Mei Riqiang of the Guang Ling School. In 1995, Ms. Lin began her guqin studies at the Shanghai Conservatory. 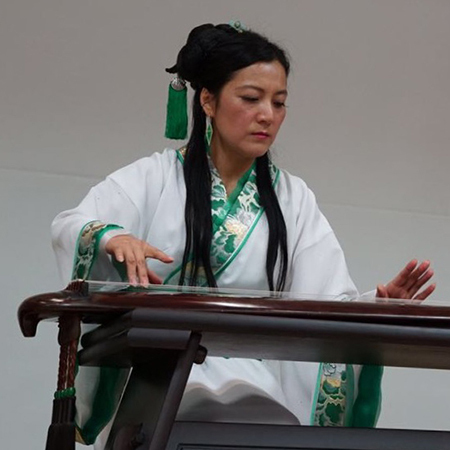 Under the tutelage of Professor Lin Youren, she further expanded her knowledge of guqin repertory, learning famous pieces from other schools of performance. Ms. Lin moved to Vancouver, Canada in 2010, where she established a flourishing teaching studio. In 2012, she established the Vancouver Guqin Society and became its director. In the same year, she helped to design and implement a guqin examination syllabus for the Canadian Chinese Music Society and became one of their exam adjudicators for the zheng and guqin. From 2012 to 2014, she taught the guqin at the University of British Columbia and organized several successful student concerts.